The Gators could be closing in on a commitment from one of their long-term priority targets as Omar Payne seems to be as high on Florida as ever. 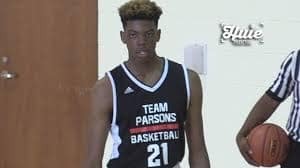 Payne, a 6’9” native of Kissimmee, Florida, has been a steady riser in the recruiting rankings since the Gators first offered him and he is currently 42nd rated player in the country. It’s not hard to see why teams would fall in love with his game as his ability to erase shots at the rim is accentuated by the ease at which he can switch out onto a guard, rapidly shuffling his feet to cut off any penetration a perimeter player might expect when seeing a big man on him. This, is we all know, is modern basketball and Payne represents the style of player Coach White has been pursuing in future classes. 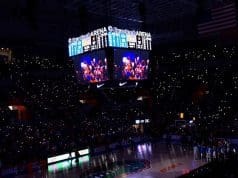 Between the switchable style Florida plays that is catered perfectly to Payne and the fact he may want to stay in-state, the Gators look to be sitting pretty and though he hasn’t set a commitment date he could very well be the first piece in the 2019 class. 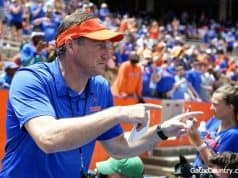 Thought to be competing most heavily with Florida State for Payne’s services, the Gators got some good news when the Seminoles may have committed a misstep in their recruiting strategy as reported by Gator Country’s own Neil Blackmon. Miami, Texas, Clemson, and Louisville are also considered to be deeply in the mix but the Gators have to be feeling pretty comfortable going into the homestretch. From the pessimistic side, there could be a couple of hurdles in the way of the Gators’ pursuit of Payne. Firstly, it could be playing time right away. Payne, like many recruits do, has claimed that coming in right away and playing immediately is an important factor to him. Though he certainly could win a spot in the rotation immediately with the orange and blue, Coach White has always rewarded players with minutes regardless of seniority, there isn’t a natural hole from him to fill in the frontcourt with the Gators only standing to lose Kevarrius Hayes to graduation next year. Keith Stone may decide to go to the pros if he has a productive season but Gorjok Gak, Dontay Bassett, Chase Johnson, and Isaiah Stokes could still be seen as potential roadblocks in Payne’s attempt to contribute right away. On the flip side, Florida State will have a sizeable chunk of frontcourt minutes available right away to whoever they land in the 2019 class with Raiquan Gray, Malik Osborne, and Mfiondu Kabengele currently in the depth chart and only Kabengele being a proven ACC contributor. Another minor concern I have from the Gators’ standpoint is how they use big men. When talking about some of his other suitors, Payne has always referenced how he likes teams that play through their big men offensively. Unfortunately, I don’t think that is something the Gators can claim. Though the team may point to Keith Stone’s offensive role as a way he potentially could be used Payne is definitely a different player and if he watched the Gators the past few seasons he knows that big men haven’t played a major role offensively. 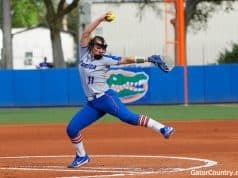 These concerns of mine could be overblown as there have been so many positive reports on where the Gators are at with Payne that I just felt as though I should be digging for something on the other side of the coin. Another positive sign for the Gators could be his upcoming transfer to Montverde Academy for his senior season of high school. Staying nearby certainly can’t hurt the Gators’ chances and having him at the school that just produced Andrew Nembhard is another plus. In a recent interview about his recruitment, Payne offered this when talking about Florida. Will Payne be the first domino to drop in the Gators’ 2019 recruiting class? We’ll have to wait and see.